ERWE3M26 – Dryer Drum Bearing for GE & Hotpoint dryers. This bearing supports the front of the drum and allows the drum to turn freely. The front drum bearing is located behind the front of the dryer and supports the front of the drum. The front drum bearing provides the mount for two “slides” which are the actual bearing surface. Worn out slides cause damage to the the front drum bearing. A failed front bearing can cause the drum to scrap against the front of the dryer resulting in a squeal or metal scraping sound. A failed front bearing may cause increased resistance for the motor to overcome when starting resulting in a slow start or a failure to start. Rear bearing should be checked as well. 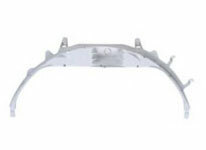 Inspect the “front drum bearing” for signs of wear and/or breakage. Bring your “front drum bearing” in for free confirmation that it is good/bad or call the U-FIX-IT store for free assistance with diagnosis.